Terry Gross is the best interviewer of all time, has encyclopedic knowledge of popular culture, gets the very best people in the arts, high end writers and the like. Essential listening. I can hardly bear to watch/listen/read the news in the usual sources. OTM is a weekly NPR show devoted to analysing the way the news of the previous week was handled and mishandled, and in the process provide a very palatable summary of the news of the week. Edited by Brooke. Tweedy British academics, mostly, with upper class accents talking about tweedy academic subjects. Gengis Kahn, Fermat’s Last Theorem, carbon, the Minoans. That sort of thing. I hope you enjoy the programme. Groovy engaging guy talking about design. Really, a very, very good program. Always read the plaque. Funny, profane and engaging smart guys, including the guy from OTM, talking about spoken language. Two Westerners who live and work in China, and know the language very well talking about all manner of things to do with contemporary China. Their guests are typically very smart people, journalists mainly including very well known writers for the Guardian, New York Times, New Yorker and Wall Street Journal. Also post doc students in various Chinaish subjects. The expat community seems pretty chummy in Beijing. Everybody knows everybody. The brain trust of the New Yorker providing the informed and detached liberal take on the events of the week. Hipster NPR type economics nerds. New Yorker staffers talk in detail about one or two articles in the magazine. A little smarmy at times. discussions of current legal topics, often including advocates from one or both sides of an issue. Ira Glass. That’s all that needs to be said. Archeology nerds giving the archeology news, which is kind of an oxymoron. Very smart media guys, including the great Robert Krulwich, doing interviews about science. 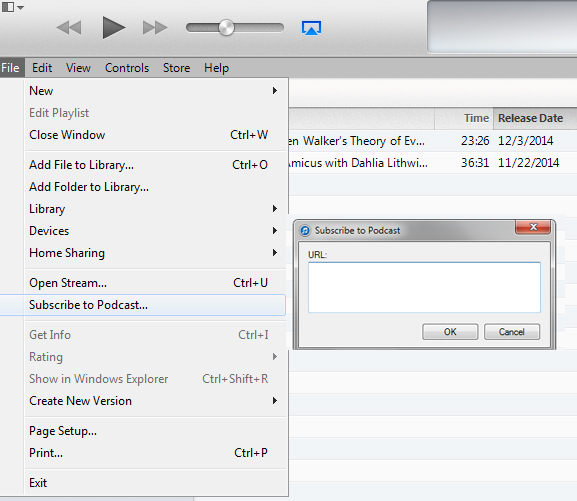 I’m not crazy about I-Tunes for podcasts, but it is sort of the default way to subscribe. I don’t use it, but most people do. And to their credit, Apple pretty much made podcasts happen by making it easy to download them and making sure they are all free. 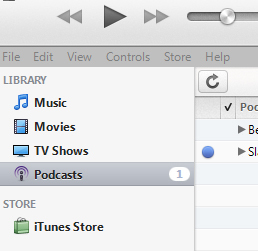 Notice the podcasts item on the I-Tunes menu.